Hackney Marsh: a place of illicit raves, time-travelling dandies, scary cults and grizzly bears, at least according to psychogeographer Gareth Rees. He blurs the line between fact and fiction like an explorer who's sipped liberally from his hip-flask before falling asleep in a pocket of marsh gas. But here's the thing: it works. Gloriously. 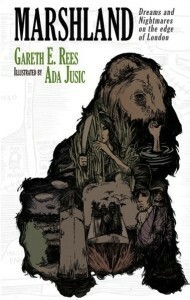 This idiosyncratic bumbleburst of local history, folklore and informed creativity captures the marshes as vividly as any book ever could. Gareth not only knows his terrain intimately, but also wants to share it in plain language that never takes itself too seriously. Given some of the conceits of the book, which plays fast and loose with fact, style, time and credulity, this could easily have deteriorated into an exercise in look-how-clever-I-am. It never does, because Gareth is a thinking, drinking, cocker-spaniel-walking man with his feet firmly on the ground (except when he's dangling over the bank of the Lee Navigation to rescue said cocker-spaniel). This is first-class writing that slithers between genres like an eel in a library. One day, all books will be written like this. Buy direct from Influx Press. Heard the one about the corpse who rode the tube for hours before anyone noticed? Did you know you're never more than <insert random number> feet away from a rat, or that Hitler wanted Senate House as a headquarters following a successful invasion? London if full of urban legends that might or might not be true — those listed above are just three of the most well-known. Here, Scott Wood compiles a whole book's-worth of tall tales and unlikely stories from the capital's past and present. Just as it's often said of fiction that there are seven basic plots, it quickly becomes apparent that there are common classes of urban legend. We find many instances of the disgruntled architect, for example, who supposedly jinxes his building to spite a difficult client. And there's the famous 'stranger's warning' — we've all seen this one doing the rounds on email or Facebook — whereby a would-be terrorist warns a helpful Londoner to steer clear of the Tube next Tuesday. It must be true as a friend of a friend told my sister in a pub. As organiser of the London Fortean Society's monthly talks, former host of the South East London Folklore Society, and occasional chronicler of the city's weirder side for Londonist, Scott is well placed to pull these episodes together. 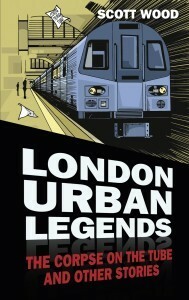 Often revealing, always entertaining, London Urban Legends is a splendid addition to the bookshelf of anyone who's curious about the capital. Plus, one in every 25 copies contains a hidden chapter giving the location of Charlie Chaplin's vanished Oscars. It's a fact. Buy direct from The History Press. Think of Columbia Road today and the immediate associations, for many, will be flowers and fashionable 20-somethings. Its modern image belies the thoroughfare's long history of hope, loss and community spirit. Linda Wilkinson, whose family have lived hereabouts for 200 years, chronicles this past in her richly illustrated new book. We start in medieval times, with a fascinating map of land boundaries and roads. We then move through the centuries taking in body-snatching, the Italian Boy murder, the slums and their clearance, the towering figure of Angela Burdett-Coutts, the wars, the post-war developments and, inevitably, the flower sellers. This is a very human book, focusing on the communities and individuals who've populated Columbia Road through the centuries. As you flick through, literally hundreds of faces smile or grimace back at you. 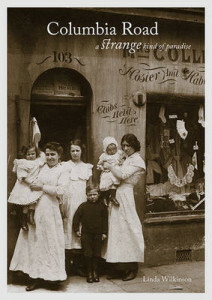 It's refreshing to find a book about the East End that focuses not on Spitalfields or Whitechapel or central Hackney, but on this equally fascinating interstice and its oft-changing population. Beautifully produced, too. Buy direct from the author. The 2060s are far enough in the future as to be beyond the scope of current planning and election cycles. Yet the decade is also soon enough that those making predictions might live to see their accuracy. This book, spun out of a project at University College London, compiles a very broad set of visions of our city, 50 years from now. This isn't sci-fi. The majority of chapters look at specific facets of the city (energy supply, population growth, politics...) and use current data trends to project where we might be in half a century. Some of these sections, full of citations and specialist terms, might be a little academic for the casual reader. Most chapters, though, are written with a more generalist eloquence. Sarah Bell's chapter, say, on the future of water provision, flooding and drainage is a splendid example of how to write about technical issues for a general audience. Towards the end, the book goes a bit more experimental, and commentators are given free reign to gaze into the crystal ball. Find out what impact Sir Roberto di Matteo will have on the capital. Share the joys of living 'after London' in a city of ruins. And watch out for the tube posters reminding citizens that it's malaria season. 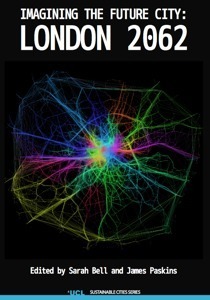 A unique book, in parts stodgy and in others exhilarating, London 2062 is a thought-provoking exploration of a city yet to come. Buy the book, or Download the free PDF (warning, it's big). This new small-publishing house looks rather tasty. 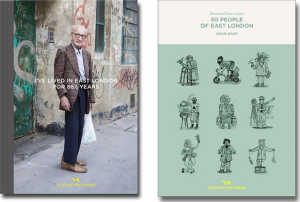 Launched via crowdfunding, it's just started putting out two book series — one photographic, one illustrative — charting the people and cultures of the East End. The debut titles are pocket treasures. I've Lived In East London For 86½ Years is a compilation of photos by Martin Usborne showing elderly Hoxton resident Joseph Markovitch going about his business. The images, and Joseph's commentary, have been published online before, but the book treatment adds to the charm and poignancy. The second title, 50 People of the East End, compiles Adam Dant's cartoon representations of local stereotypes such as the app billionaire, street food evangelist, graffiti tourist and barge-dwelling fantasist. It's vicious in places, but feels somehow celebratory at the same time. Anyone who's spent any time in Hackney will recognise at least half of these 'types', and possibly fit into more than one of them (we fear we're becoming 'Flat white bore' and/or 'Smartphone diviner'). Buy direct here. This slim, exquisite hardback is a collection of six essays written by Virginia Woolf in 1931 for publication in Good Housekeeping magazine. They're a chatty, informal musing on contemporary (as it was) London life, from the bustle of the woking docks, Oxford Street (did you know there used to be a man selling tortoises? ), the houses of Keats and Carlyle, St Paul's and Westminster Abbey, the House of Commons and Londoners themselves. It is a love song to London, brimming over with Woolf's adoration for the city and her impeccable eye for just the right detail to bring a scene to life. It is also beautiful, with Art Deco-style chapter headings and illustrations. Published by and available from Daunt Books, it's like a hug in book form. Buy from Daunt. 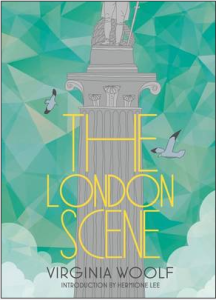 Reviews by M@, except The London Scene, reviewed by Rachel Holdsworth. See our map of London's independent bookshops.